I never thought I’d fall in love again. And certainly not with a building! Yet there I was, heart pounding, eyes damp at the sight of her. Funny how the first few times I’d seen her, I never felt this “hit” of passionate connection. But that’s often how love strikes us, isn’t it? Not much interest at first—but then, Pow! Like a thunderbolt. The first few times I’d seen her, she was just an object. A place to visit. A Gothic cathedral, begun in 1175, added to over the centuries, still standing more or less intact, which is a miracle in itself. 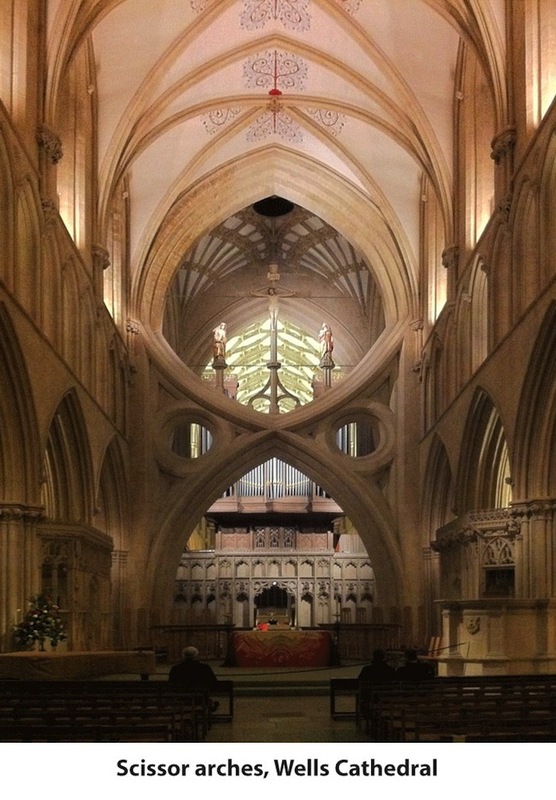 Described as “the most poetic of the English cathedrals,” she is the central attraction in Wells, Somerset, “the smallest city in England,” or so the tourist brochure proclaims. 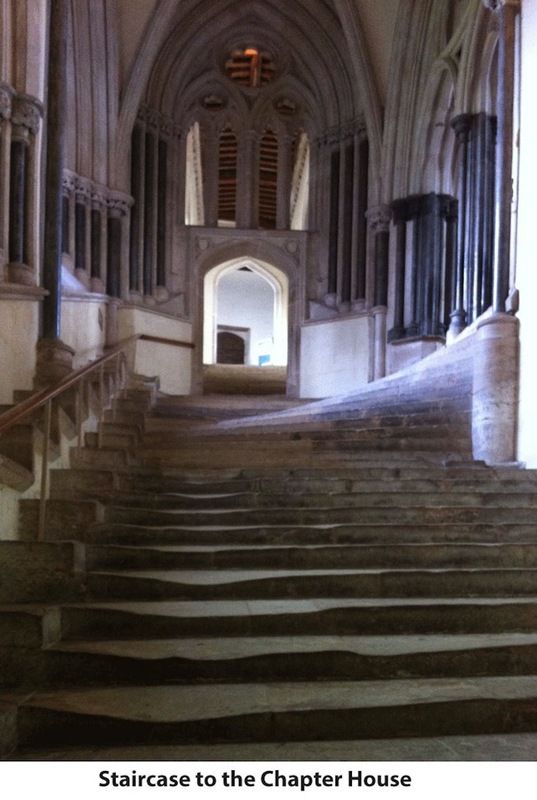 My husband, Gary, and I had visited Wells Cathedral several times, entering her, like so many other casual visitors, without (figuratively) even wiping our shoes. We had admired her carved columns and the delicate, repeating Tree of Life pattern painted on the distant ceilings. We had appreciated the acoustics in her octagonal chapter house and watched the colorful wooden figures on the nearly 700-year old astronomical clock go through their paces on the hour and quarter hours. We had marveled at the graceful scissor arches constructed out of two pointed arches, one facing up, one down, that brace the four sides of the heavy central tower. We had walked around her grounds to get a glimpse of St. Andrew’s Holy Well, framed like a picture postcard in a rectangular opening in a high stone wall. When we left the cathedral, we mentally added it to the list of others we had visited. Been there, done that—in fact, done that several times. But through some act of grace, this time was different. We had booked a room in an ancient gatehouse inn, the back of which opened directly onto the cathedral grounds. We arrived in early evening, checked in, pulled back the curtains of our room, and looked out. It was dark and a light mist was falling. As we watched, the cathedral coquettishly appeared and disappeared, as if hiding behind a flimsy, fluttering veil. Spotlights that were pointed at her western façade created an evocative chiaroscuro of mellow gold and deep shadow, reminiscent of a Rembrandt portrait. I couldn’t restrain myself. Grabbing my umbrella, zipping up my rain jacket, I ran back down the twisting stairs of the inn and out the back door. Shoes squishing on the sodden grass, I hurried towards her. Ahhh. I felt a longing filled, a need requited that I didn’t even know I had. As I approached, I admired her elaborate 100-foot-high western façade, a glorious inning-and-outing of large square towers covered with a total of 300 solemn oversized statues, each barely contained within its stony niche. My eyes traveled up the three horizontal rows until the figures disappeared into darkness. She seemed to be waiting for me. Or at least I thought so as I tried to restrain my wilder “imaginationings.” She seemed to be aware of me. Aware that I was watching her. Aware that I was watching her watching me. In that moment, we were no longer see-er and seen: we were in shared communion, sharing communion, and I don’t mean bread and wine. She wasn’t an inanimate construct of stone, glass, and mortar—she was a conscious being. I was chilled, drenched, shivering in the rain, and irredeemably, unrepentantly in love. I thought of Malcolm Miller, the great authority on Chartres Cathedral near Paris. His life’s passion has been the study of that exquisite French temple dedicated to Notre Dame. I wondered whether he, too, was smitten during a casual visit. Reluctantly returning to our cozy hotel room, I tried to sleep. But I woke up frequently to pull back the curtains and admire her again, observing how she changed in the gentle light of dawn, as if she were gradually waking up from slumber. She wasn’t an edifice of stones, a neutral container waiting to be filled. She was somehow sentient, responding to the rising sun, the rain, the change of seasons. Gary joined me at the window and stared as morning light caressed the cathedral. He held me close, sensing what I sensed, if not quite so intensely. After a hurried breakfast, we rushed over to enter into this being with whom I had formed an uncanny, formerly unimaginable relationship. This time we paused before crossing the threshold, silently asking permission to enter instead of barging in like uninvited guests. We joined a free tour and gawked with a large family from Minnesota and a smaller family from San Francisco as our guide pointed out amusing carved capitals (a man pulling a thorn from his foot, another with a swollen jaw and toothache). He shone his laser light on a tale of grape theft and rapid punishment that circled like a series of cartoon frames around the top of a column. The hour was struck, and we rushed to watch the medieval astronomical clock put on its display of knights jousting around a central axis—much like a modern carousel. One poor rider has been knocked off his horse every hour for nearly 700 years. I learned about the cathedral music school and the Wells Cathedral Choir, some of its members housed across the street in the 15th-century “Vicars’ Close”—the oldest intact close in all of England. I learned about the church’s near-destruction during the Monmouth Rebellion in 1685, when the Lady Chapel behind the altar was partly torn down and the church was used as a stable. Our guide explained that many of the medieval stained glass windows had been destroyed, reconstructed some 150 years later in a kind of crazy-patchwork mosaic of bits and pieces. That explained why a black-etched outline of a leg was juxtaposed with a broken leaf, a beard was attached to a face it didn’t seem to fit…. I learned a lot of facts and figures, which did nothing to augment my love for her—and nothing to diminish it. After all, love has nothing to do with logic. Late that afternoon we returned to listen to the Evensong service. The melodic voices of the girls’ choir floated effortlessly, filling the space with joy. I could almost feel the cathedral shimmering with the vibrations of sound. I was acutely aware that I was inside a being—a being that has seen pageantry and pathos, death and destruction, celebration and ceremony—a being that witnessed daily Mass and prayer for over 800 years. Just think about it. Just imagine. 800 years of communion, of worship. That does something, all those vibrations of music and word. After all, “In the beginning was the Word”—and the Word is sound. And sound is vibration. Over the years, Gary and I have visited many sacred sites and powerful places. We have learned that these places draw on the underground energies of water and geological faults. Traditionally, they were constructed according to specific geometrical principles that relate their dimensions to the passage of the sun throughout the year. I have written about how these energies change depending on the cycle of the seasons, the fullness of the moon, on who did what most recently at a given site. I have said these things and believed these things—but in some fundamental way I had never really understood that these sacred sites are not simply receptacles for human activities. They are sacred beings. If I lived nearby, I would volunteer to serve my beloved cathedral. But I don’t. So the best I can do is to share my love story with you. Perhaps, with a bit of grace, the next time you visit a sacred space you, too, will enter into wordless communion with the living spiritual presence of a powerful being. Elyn Aviva is a transformational traveler, writer, and fiber artist who lives in Girona, Spain. Her blog is www.powerfulplaces.info. She is co-author with her husband, Gary White, of “Powerful Places Guidebooks.” To learn more about her publications, go to www.powerfulplaces.com and www.pilgrimsprocess.com. To learn about Elyn’s fiber art, go to www.fiberalchemy.com.